We are now close enough to the upcoming snow/cold event that some of our most powerful prediction tools, such as high-resolution ensembles (many forecasts), are now becoming available. And, of course, forecasts become more skillful as we get closer in time. The bottom line is that it is becoming increasingly likely that light snow will fall over the portions of the lowlands of western WA, including the central Puget Sound region. Let's start with the latest high-resolution WRF forecast for snow, covering the accumulated snowfall for the 24 h ending 4 AM Monday. Lots of light snow associated with a low center moving down the coast, with substantial variations. But let's look closer over western WA. 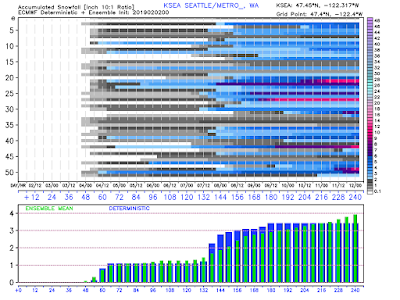 There is a north-south band of snow of 2-4 inches that crosses over Seattle. This is associated with what is often called a "deformation band" and I would not bet my life on its exact position. A small area of heavier snow is found on the north side of the Olympics, associated with strong NE flow from the Fraser Valley being forced upwards by the Olympics. The accumulated precipitation by the lower resolution European Center model is found below... it is also showing a N-S snow band, but displaced a bit to the east. So the single-solution deterministic forecasts show a threat of lowland snow. But there is plenty of uncertainty in this forecast, since everything is dependent on where the coastal low moves and where the snow band sets up. The way to handle that issue is to turn to high-resolution ensembles, running the models many times with slightly different initial conditions and physics to see how robust the snow solution is. 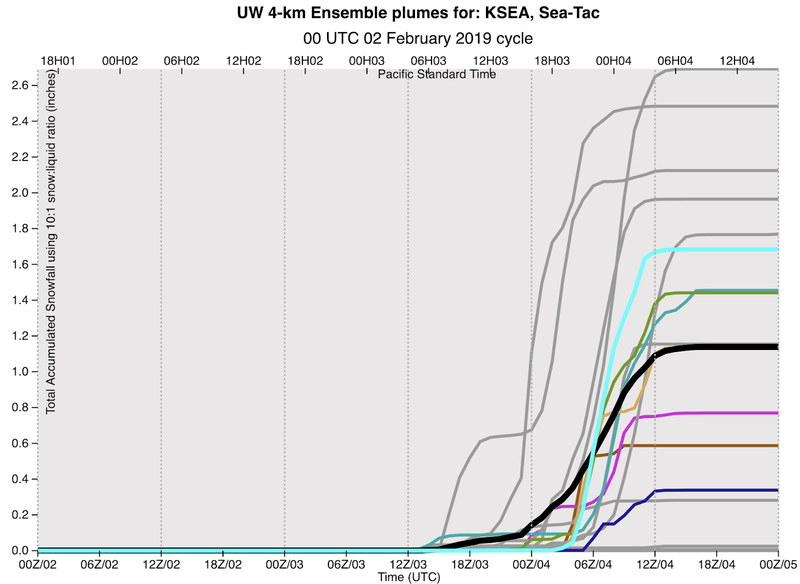 We are fortunate in the NW to have perhaps the best high-resolution ensemble system in the country thanks to the support of the NW Modeling Consortium (a number of state and local agencies) and those that contribute to the effort through this blog. Here is the snow prediction for Seattle from our ensemble system from last night's run. There is a lot of variability (thus uncertainty), with the ensemble mean (probably the best single forecast) of a little over 1 inch (note that time is in UTC/Z---standard time at the Greenwich Meridian). 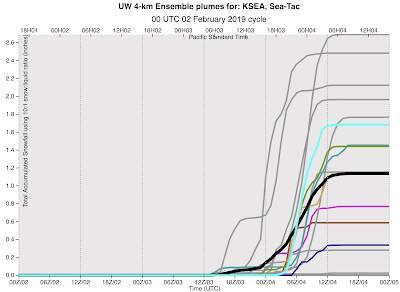 I suspect the next ensemble forecasts will be higher. The ensembles are also confident that all hell will break loose in Bellingham, with strong northeasterly winds developing tomorrow and associated very cold temperatures. What about the European Center ensemble, which is relatively coarse? 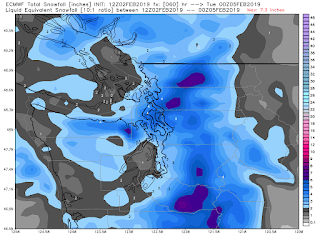 Most of the members are going for light snow Monday AM in Seattle, with the average about 1 inch (see below)--but note the much bigger event later in the week. In summary, tomorrow cold air will move into the region (see my previous blogs for more on this), with temperatures dropping below freezing Monday AM. Strong winds over NE Washington developing on Sunday. And some lowland snow is likely Monday morning....but no more than a few inches. But there is plenty of uncertainty regarding the exact amounts and distribution. 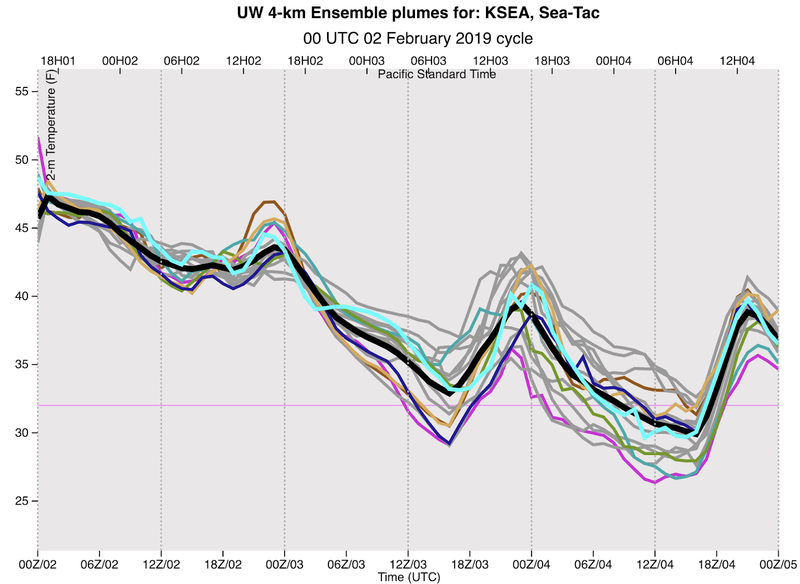 I suspect Seattle, WSDOT, and others will prepare by doing some pre-treatment of roadways on Sunday, which will prevent an ice build up on critical roadways. The homeless folks need to get inside. The commute on Monday may well be affected. 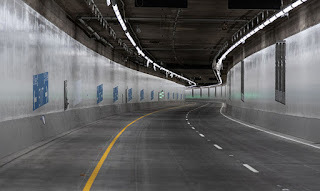 But thank god we have the new tunnel in Seattle-- no snow problem there! "Much bigger event later in the week"? What's this about? 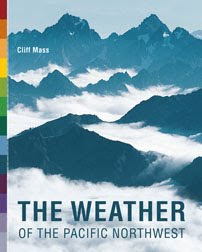 Hi Cliff: I enjoy reading your forecasts. I especially appreciate the straight forward, hype-free explanations of complex situations such as this one. They say that the mark of true genius is the ability to explain a difficult concept in language that anyone can understand. Incidentally, even though I live in Victoria, B.C., I read your forecasts regularly and extrapolate from there. Best wishes from Canada. Another forecast where the WRF modeling shows interesting detail, but all maps put Longview/Kelso on the edge. Could some grad student please allow us to use a hi-res WRF map with our own choice of center point, so we can get a feel for how close the heavier precip might be to us? Thanks Cliff - hard to complain about a great model but oh those cruel edges..
How is Sunday afternoin looking? I've seen some models showing snow in SW Washington between Olympia and Hoquiam, especially the Black Hills, as early as noon on Sunday. 2 weeks of fun coming . Will the Bertha Tunnel have its' own weather? Latest GFS run(18z) is showing potential for more snow later in the week. Hopefully it's not just a one off model run. Not true Roy. Quit looking at the gfs model, which is garbage. The Euro handles these patterns much better and even the Nam handles patterns better within 48 hours . Time to dump the gfs and start from scratch. Thanks for the time and expertise you invest in our region, Cliff. It definitely makes a difference. 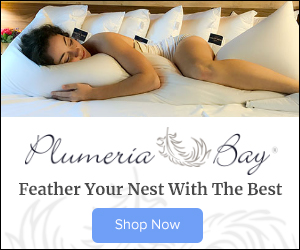 I hope you find it worthwhile too! I agree with the assessment of your forecasts from the person from Victoria! Looking forward to hearing more about snow potential/probability for later in the week. You are saying 'all hell will break loose in Belingham'. Is this really going to be any worse than the cold spells we had here in Bellingham (I am living on E. Victor near Cornwall Park) and I have lived here three years and been through cold spells, but it has not prevented me from getting around on my bicycle (I am car-less). You make it sound that this will be worse than anything int he last three or four years? Or am I mis-reading you? It started snowing in Bellingham at 8:32 AM. Snowing hard by 9 AM. Let it snow! Let it snow! Let it snow! 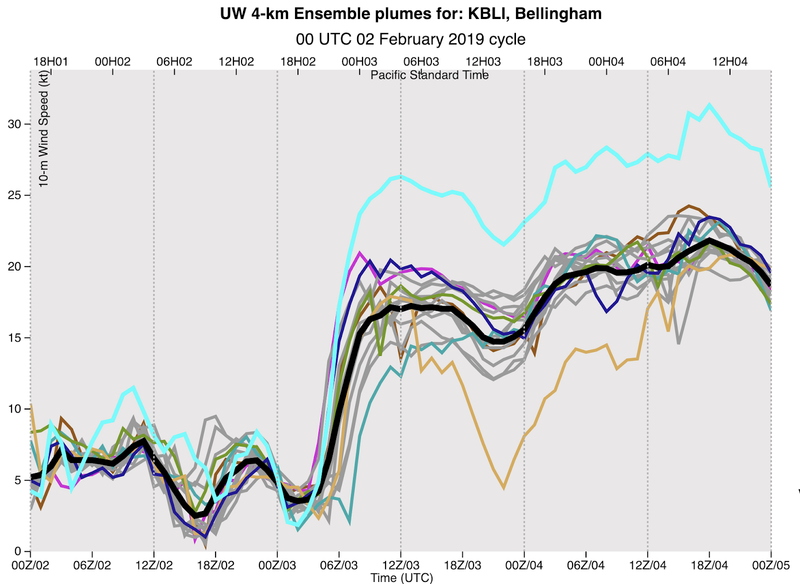 Yes, this event is likely to produce more severe winter weather conditions, at least from the perspective of a cyclist, given the probability of sub-zero wind chill temperatures which have not occurred in Bellingham since 2013 or 2014. Though there certainly has been cold weather, particularly December 2016, I do not recall that there have been cold temperatures associated with high winds - at least in the South County - for at least 5 years. Bundle up and make sure to protect your face as the very dry nature of strong, cold Fraser outflow can chap skin surprisingly quickly.